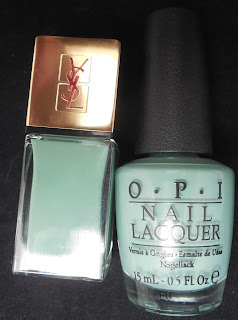 Good evening dears, I have a request to compare OPI Thanks A Windmillion and YSL Jade Imperial. They're both pretty jade creams but there's quite a price difference between the two. Formula is very similar for both, each could be nearly a one coater but two coats provide even coverage. The brushes are both wide and there's no pooling or streaking for either. Both dry to a high shine on their own. Thanks for the question The Ramblings Of A Maniac!